The laidback sounds of Regina, Saskatchewan songwriter Andy Shauf filled Supercrawl's sunny skies on its final afternoon of weekend. Still riding the wave of well-deserved success from his Polaris-shortlisted record The Party, Shauf, armed with an acoustic guitar, was backed by an impressive band consisting of two clarinet players, keys, bass guitar and Fet.Nat's Olivier Fairfield on drums. The five-piece sounded impeccably lush and balanced. Offering little dialogue in between soothing numbers like "Hometown Hero," "Eyes of Them All" and "Quite Like You," Shauf only paused a handful of times to make gentle remarks on the warm weather and how the sunlight was casting its glow on his guitar. 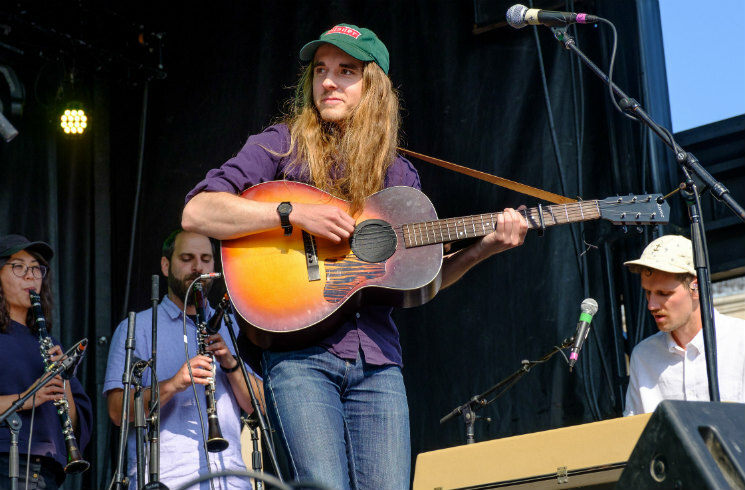 The large crowd that had gathered for Shauf's performance accepted his reserved nature, simply happy to hear his folk-tinged tracks come to life. With a live persona as stoic and calm as his music, Shauf and company delivered a consistent and easygoing performance.